Let's start with the conclusion... this is a massive issue and one that B2B demand gen marketers are often not as familiar with as they should be. Do yourself a favor, read this post and then ask your vendors what they do to help monitor, identify and measure ad fraud. While nobody is perfect at solving this issue, only a few account-based advertising platforms do anything about it. Estimates indicate that non-human, bot traffic can be account for as much as 50% of ad impressions, even clicks and website traffic. Believe it or not, bots can even complete form-fills... your leads may never have happened! 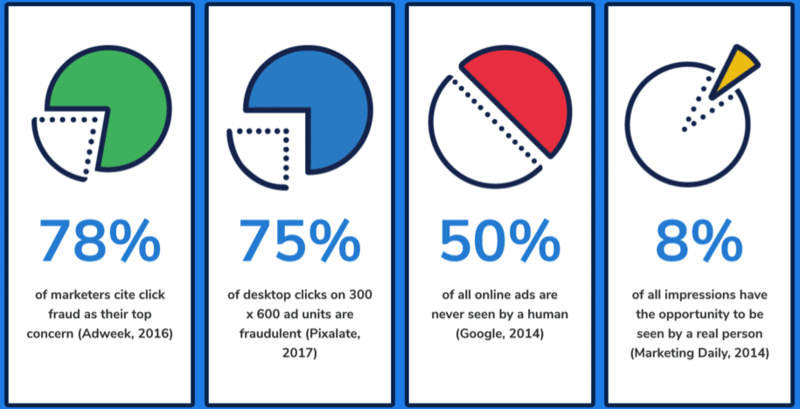 What are you doing to monitor and minimize the issue of ad fraud? What sites does it come from? Can I remove these publishing sites from my ad campaigns? While this huge news story made just a blip on the radar of overall news, it brings to mind the need to discuss the scale of the issue. Here are the background stories: White Ops press release, Department of Justice press release. While Google and Microsoft both disputed the browser-based approach by FraudLogix, a separate study by the Association of National Advertisers (ANA) determined the issue to cost advertisers $7B in 2015, delivering ads that nobody will ever see. The World Federation of Advertisers estimates the fraud number to have increased to $19B in 2018. Consider this, at this scale "ad fraud could become the second largest organized crime enterprise behind the drug trade."